That was my initial reaction as TRACK 13 began and would remain until the final round of applause for a cast of brilliant youth who delivered one of the most magnificent, emotionally chaotic and awe-inspiring performances I’ve ever witnessed. I wasn’t sure what to expect from this “playformance” by The Young Fugitives who took it upon themselves to cover the disastrous events that occurred on February 10, 2014 when teenager Deonta Mackey was killed as he attempted to rob an off-duty Cook County Sheriff. To know the premise is unsettling enough but to see it recreated before our very eyes, well, it brought up questions, concerns, doubt and a sense of confusion about that situation as well as the state of affairs across the country and especially in our highly volatile city. It also proved the power of unity and the ability that healing has through art, through conversation and through mutual understanding of each other’s lives, whether or not we ever find a reason or logic behind events that ultimately affect us all. Appearing in jeans, wife beaters and whiteface, The Young Fugitives approached the stage with utmost confidence. Settling themselves in to a soundtrack of sirens, hip hop and actual audio recordings of news broadcasts (including Mackey’s mother repeating, “I did the best I could for him,”) the cast presented their version, looped for effect, of the moment Mackey was shot. Actor Patches Blanton is haunting in his portrayal of death in repetition as he falls to the ground only to get up over and over again among the piercing firestorm of gunshots with his friends looking on in terrified stupor. You wonder about the scene repeating so much and then begin to understand the significance of this specific moment. The playformance does a beautiful job of incorporating all kinds of music – from hip-hop to Monroe’s birthday song – along with an amalgam of creative sound bites and juxtaposed scenarios. 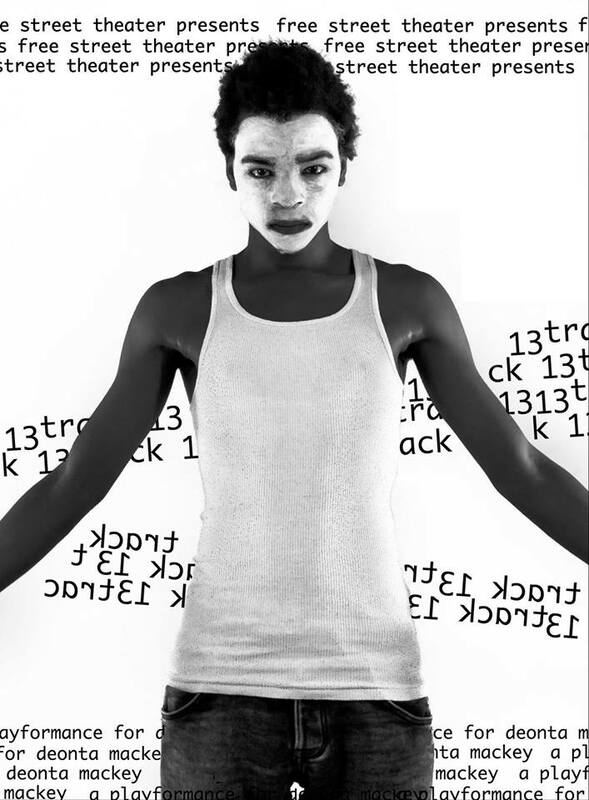 Through dance, agile movements and an in-your-face real life ranting dialogue and discussion of each actor’s own interpretation of what happened, TRACK 13 delivers a much needed look at what our youth feels about these occurrences. They question everything they do, who they are, where they come from, where they’re going and even what we as an audience is doing there, all presented in the span of less than an hour. I’ve never been more impressed with a performance of this nature. It makes me proud, it makes me sad, it makes me feel empowered and it makes it necessary for me to ask that you see it. There’s much more than this tiny review could ever explain so you must experience this for yourself and be inspired by the questions it answers as well as those it leaves unanswered. Tickets are available here. Congratulations to Garcia, Elijah Ruiz, Eliseo Real, Omari Ferrell, Patches Blanton and Tyran Freeman for your outstanding performances. You are all so beautiful! Ricardo Gamboa, Sean Parris, Sadie Woods and Emmaleigh Pepe-Winshell, you all need to get together more often to make more of these impressive productions. TRACK 13 opened Friday, September 18 and will run for six weeks at Free Street Theater located on the 3rd floor of the Pulaski Park Field House, 1419 West Blackhawk Street. Dates: Fridays – September 25, October 2, October 9, October 16, October 23. All shows begin at 7:00 p.m. with doors at 6:30 p.m. Inspired by The Young Fugitives performance of TRACK 13, here is what happens when a writer comes home from such a mind-blowing production. All I know is there’s always hope.